Cari Glyn is the pen name of Jen Pritchard. Jen was born in Bargoed and has many happy childhood memories growing up in the local community before the pit finally closed. After completing A levels, she left home to study for a BSc at University College, Cardiff and went on to complete a PhD in Zoology. After a 30 year career in education, Jen recently retired and returned to live in south Wales. 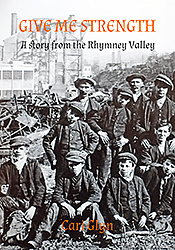 She has used her research into local and family history online and using local newspaper archives to write this first novel based in the Rhymney Valley. Cari sounds like the Welsh verb caru – to love. Glyn is a Welsh noun for a valley. So Cari Glyn is the pen name I chose to write this first novel, one of many I hope, in a series of Stories from the Rhymney Valley. I grew up in Bargoed in the last decade before the local colliery closed and enjoyed a happy, fulfilling childhood in a once thriving coal mining community. Like many of my generation, I moved away but never lost my links with the area. I started researching my family history to discover mining had brought many generations of my family to the valley from all parts of Wales. I have always been interested in local history and discovered a wealth of information in the local newspaper archives. All this research provided the inspiration and basis for this novel. Anyone who shares my ‘love of the valley’ with its traditions and history will hopefully enjoy reading ‘Give me Strength’ as much as I have enjoyed writing it. The year is 1909. Bargoed is a burgeoning town in the Rhymney Valley since the sinking of the coal mine by Powell Duffryn Steam Coal Company. Walter Lewis, the newly elected miners’ agent represents the working men of the valley who pay their penny due to the Fed, the South Wales Miners Federation.